The γ-herpesvirus, EBV, is reliably found in a latent state in endemic Burkitt’s lymphoma. A single EBV gene product, Epstein-Barr nuclear Ag 1 (EBNA1), is expressed at the protein level. Several mechanisms prevent immune recognition of these tumor cells, including a block in EBNA1 presentation to CD8+ killer T cells. Therefore, no EBV-specific immune response has yet been found to target Burkitt’s lymphoma. We now find that EBNA1-specific, Th1 CD4+ cytotoxic T cells recognize Burkitt’s lymphoma lines. CD4+ T cell epitopes of EBNA1 are predominantly found in the C-terminal, episome-binding domain of EBNA1, and ∼0.5% of peripheral blood CD4+ T cells are specific for EBNA1. Therefore, adaptive immunity can be directed against Burkitt’s lymphoma, and perhaps this role for CD4+ Th1 cells extends to other tumors that escape MHC class I presentation. The human γ-herpesvirus, EBV, was originally isolated from Burkitt’s lymphoma (BL)3 cells, a human B cell lymphoma, by Epstein and Barr (1, 2). The pathogenesis of EBV-positive BL appears to involve the combined actions of virus-induced B cell proliferation and a chromosomal translocation juxtaposing c-myc and Ig gene loci in a single B cell. Holoendemic malarial infection is thought to facilitate this oncogenic process. Therefore, BL occurs with increased incidence rate in children in Sub-Saharan Africa (3), in South America (4), and in Papua New Guinea (5). In addition, BL is increased in AIDS patients (6, 7, 8). Currently, there are no specific antiviral drugs, vaccines, or other immune-based therapies available for this disease. Although this tumor is very responsive to chemotherapy and radiation, these treatments have significant toxicity. The Epstein-Barr nuclear Ag 1 (EBNA1) is the only viral protein expressed in these tumors. This expression pattern is called EBV latency I (9). Most other EBV-associated malignancies express either the two latent membrane proteins (latent membrane protein (LMP)1 and LMP2) in addition to EBNA1 or all EBV latent Ags, EBNA1, 2, 3A, 3B, 3C, LP, and LMP1, and 2. These two expression patterns are termed latency II (present, for example, in Hodgkin’s lymphoma and nasopharyngeal carcinoma) and latency III (present in lymphoproliferative disease), respectively. The latency II and III expression patterns are also found in tonsils of healthy asymptomatic carriers of EBV (10). Apart from EBV-infected resting peripheral memory B cells (11, 12, 13), expression of EBNA1 is maintained in all EBV latency states and all EBV-associated tumors, most likely because of its critical functions. The EBNA1 protein initiates EBV episome replication before mitosis, and it anchors the viral episome to mitotic chromosomes during cell division (14, 15, 16, 17). This ensures persistence of EBV DNA in proliferating cells and, therefore, maintains EBV-encoded small RNA genes, which contribute to oncogenecity in BL (18, 19). At the same time, the important EBNA1 viral Ag evades recognition by CD8+ T cells in EBV-transformed cells (20). EBNA1 contains a Gly/Ala domain that prevents cytosolic degradation by inhibiting proteasomal digestion (21, 22). Because none of the other EBV latent Ags are expressed in BL cells, the dominant CD8+ T cell responses against EBNA3A, 3B, 3C, and in some MHC class I haplotypes LMP2 (23, 24) are not effective against BL cells and, therefore, do not mediate protection against this tumor. Indeed, it was described early on that the MHC class I-restricted CTL function was ineffective against BL cells (25, 26). EBNA1 is just one example of herpesvirus gene products targeting MHC class I Ag presentation. The herpes simplex virus product ICP47 blocks TAP, preventing the import of antigenic peptides into the endoplasmic reticulum (ER) (27). Human CMV synthesizes an array of proteins interfering with HLA class I presentation; US6 also blocks TAP (28), US3 retains MHC class I complexes in the ER (29), and US2 and US11 transport MHC class I H chains back into the cytosol for proteasomal degradation (30, 31). These examples indicate that human herpesviruses in their long coevolution with the human host have developed many strategies to evade CD8+ T cell recognition. The human immune system has, however, managed to find another way to detect latent EBV infection using EBNA1 as an Ag. We have recently shown that EBNA1 is recognized by CD4+ T cells in most healthy EBV carriers tested to date (32). These CD4+ T cells mediate primarily a Th1-type response, secrete IFN-γ, and are capable of killing lymphoblastoid cell lines (LCLs) (32, 33). Importantly, the recognition of EBNA1 in EBV latency III tumor cells occurs after endogenous processing of the EBNA1 Ag, rendering the EBV-transformed B cell susceptible to lysis by this CD4+ T cell response (32). We now extend these findings to the recognition of BL cells by EBNA1-specific CD4+ T cells. We demonstrate that EBNA1-specific CD4+ T cell lines and clones secrete IFN-γ and directly kill these tumor cells via Fas/Fas ligand (FasL) ligation. This is the first study to demonstrate T cell reactivity against an endogenously expressed target in BL cells. In addition, we show that established and TCR-typed EBNA1-specific CD4+ T cell clones recognize physiological levels of EBNA1, expressed during EBV latency I, II, and III, and target epitopes from the C-terminal, episome-binding domain of EBNA1. Furthermore, recognition of EBNA1 is restricted by a diverse set of HLA class II molecules, and the frequency of CD4+ T cells, directed against the C-terminal immunogenic EBNA1 domain, is ∼0.5% in peripheral blood of healthy EBV carriers. Overall, these data indicate that BL is not resistant to immune control, and suggest a potential function for EBNA1-specific CD4+ T cells in the control of EBV-induced malignancies. The EBV-transformed B cell lines LRM (HLA-A2, -B44, -DRB1*0401, -DQA1*03, -DQB1*0301, -DP4) (34), LG2 (HLA-A2, -B*27052, -Cw1, -DRB1*0101, -DQA*0101, -DQB1*0501, -DPA1*0101, -DPB1*0201) (35), BC LCL (HLA-A*3001, -A*3201, -B*1302, -B*4402, -C*0602, -C*0501, -DRB1*0401, -DRB1*0701, -DRB4*01, -DQB1*0302, -DQB1*0201), NL LCL (HLA-A1, -A3, -B7, -B8, -DR7, -DR17, -DRw52, -DRw53, -DQ2), Ag876 (HLA-DR7, -DR11; a gift from R. Khanna),the B/T hybrid T2 (HLA-A2, -B5, -Cw1, -DR−, -DQ−, -DP−) (36), theEBV− BL lines Ramos (HLA-DRB1*0701, -DRB4*01) (37), the EBV+ Hodgkin’s lymphoma cell line RPMI6666 (HLA-A*0201, -A*0301, -B*0702/15, -B*1801/05, -C*0702, -C*0701/06, -DRB1*1501, -DRB5*01,-DQB*0602/11; American Type Culture Collection, Manassas, VA), and the EBV− Hodgkin’s lymphoma cell line L428 (HLA-A*0301, -B*3503, -C*0401/03/05/07, -DRB1*1201/06, -DRB3*02, -DQB1*0301/09; a gift from M. Vockerodt (University of Cologne, Cologne, Germany) and D. Kube (University of Göttingen, Göttingen, Germany)) (38) were cultured in RPMI 1640 + 10% FCS + glutamine + gentamicin. EBV+ BL cell lines Mutu (HLA-A1, -A2, -B45, -B70, -DR3, -DR7) and Ous (HLA-A11, -A28, -B27, -B45, -DR1, -DR4) were a gift from R. Khanna (Queensland Institute of Medical Research, Brisbane, Australia) and cultured in RPMI 1640 + 20% FCS + glutamine + gentamicin. The EBNA1low transfectant, L428PIIFA, and the EBNA1high transfectant, L428PC5III, of the EBV− Hodgkin’s lymphoma cell line L428 (gifts from M. Vockerodt and D. Kube) (38) were cultured in RPMI 1640 + 10% FCS + glutamine + gentamicin + 1 μg/ml puromycin (Sigma-Aldrich, St. Louis, MO). The BC LCL and NL LCL were generated by culturing PBMC of healthy donors with supernatantof the marmoset cell line B95-8 (39) in RPMI 1640 + 20% FCS + glutamine + gentamicin + 1 μg/ml cyclosporin A. Whole blood from lab donors served as sources of PBMC, isolated by density gradient centrifugation on Ficoll-Paque (Pharmacia, Uppsala, Sweden). Positive selection for CD4+ or CD14+ PBMC was performed using αCD4- or αCD14-MicroBeads, MS+/RS+ columns, and MiniMACS separator (Miltenyi Biotec, Bergisch Gladbach, Germany). DCs were generated from CD14+ PBMC. A total of 5 × 105 CD14+ PBMC/ml was plated in six-well plates with RPMI 1640 + 1% single donor plasma + glutamine + gentamicin. Medium (100 μl) was added at days 2, 4, and 6. Human rIL-4 (rhIL-4) and rhGM-CSF were added to a final concentration of 500 and 1000 U/ml, respectively, at days 0, 2, 4, and 6. On day 6, the floating immature DCs were transferred to new plates at 3 × 105 cells/ml, and half of the medium was replaced with fresh medium containing IL-1β/IL-6/TNF-α/PGE2 (all except PGE2 from R&D Systems, Minneapolis, MN; PGE2, Sigma-Aldrich) to mature the DCs for 2 days. The maturation cytokines were added to a final concentration of IL-1β, 10 ng/ml; IL-6, 100 U/ml; TNF-α, 10 ng/ml; and PGE2, 1 μg/ml. DCs and T cells were used fresh or following cryopreservation. DCs were either infected with recombinant vaccinia viruses (vv) multiplicity of infection 2 after maturation or loaded with recombinant proteins (10 μg/ml) before maturation, as described previously (32). As previously described (33), rEBNA1458–641 and recombinant proliferating cell nuclear Ag (PCNA) were purified by Ni-affinity chromatography using their His tags from transformed Escherichia coli. Recombinant proteins were added at the indicated concentrations together with the DC maturation stimulus. Recombinant vv were expanded and titrated, as previously described (32). CD4+ PBMC were stimulated with irradiated (3,000 rad) mature DCs at a ratio of 30:1 (T:DC) or irradiated (20,000 rad) LCL at a ratio 10:1 (T:LCL) in DMEM + 5% AB serum + glutamine + gentamicin. The RJD CD4+ T cell clone was created by stimulation of MACS-purified CD4+ T cells with vvEBNA1ΔGA-infected DCs for 1 wk and 1-wk restimulation with rEBNA1-loaded DCs, followed by direct cloning. A4 CD4+ T cell clones were obtained by 1-wk stimulation and 1-wk restimulation of MACS-purified CD4+ T cells with EBNA1514–527 peptide-pulsed DCs and direct cloning. BC CD4+ T cell clones were obtained after alternating stimulations with vvEBNA1ΔGA-infected DCs and autologous LCL. Different protocols for these three lines were used due to reagent availability. Alternating stimulations were used to avoid expansion of vv-specific (rvv), other EBV Ag-specific (LCL), or E. coli-specific (rEBNA1) T cells. Our method of choice would be alternating stimulations with rEBNA1-loaded DCs (to increase specificity) and autologous LCL (to increase affinity). Twice the line was enriched for EBNA1-specific CD4+ T cells to a frequency of 1.5% using the IFN-γ secretion assay, according to the manufacturer’s instructions (Miltenyi Biotec). EBNA1-specific CD4+ T cells were cloned at 10, 1, or 0.3 T cells/well in RPMI + 8% AB serum + 150 IU/ml rhIL-2 (Chiron, Emeryville, CA) + 1 μg/ml PHA-L (Sigma-Aldrich) + glutamine + gentamicin. A total of 105 irradiated PBMC (3,000 rad) and 2 × 103 irradiated LCL (20,000 rad)/well was added as feeders (40). After 14 days, expanding wells were tested in split-well ELISPOT assays against DC + vv thymidine kinase (TK−)/DC + vvEBNA1ΔGA or DC + cognate peptide/DC + noncognate peptide, HLA class II-matched and mismatched LCL. Specific clones were expanded under the same conditions at 5,000 clonal T cells/well. T cell clones were stained with simultest αCD4-FITC/αCD8-PE and isotype controls IgG1-FITC/IgG2a-PE (BD PharMingen, San Diego, CA). TCR analysis was performed with αCD3, the isotype control 19.1, αTCR Vβs 1, 2, 3, 5.1, 6.7, 8, 9.1, 11, 12, 13.1, 14, 16, 17, 18, 21, and 22 (gifts from Dr. D. Posnett (Cornell University, New York, NY)), or αTCR Vβs 1, 2, 3, 5.1, 5.2, 5.3, 6, 7, 8, 9, 11, 12, 13.2, 13.6, 14, 16, 17, 18, 20, 21.3, 22, and 23, followed by visualization with a goat anti-mouse IgG-9PE (Biosource International, Camarillo, CA). Samples were analyzed on a FACSCalibur (BD PharMingen). Intracellular LMP1 staining was performed after saponin permeabilization with the CS1-4 Ab (DAKO, Glostrup, Denmark). Cells were washed in RPMI, left to sediment on polylysine-treated Carlson Scientific (Peotone, IL) slides for 30 min in RPMI at 37°C, and fixed in 4% paraformaldehyde/PBS/0.1% saponin (Sigma-Aldrich) for 20 min at 4°C. The cells were then washed three times with blocking buffer from the thymic shared Ag amplification kit (NEN Life Sciences, Boston, MA). For EBNA1 detection, the cells were blocked for 30 min at room temperature with blocking buffer and incubated with the 1H4 Ab (41) at 1/50 in RPMI containing 0.1% saponin and 5% normal goat serum for 2 h at 4°C. After three blocking buffer washes, the cells were incubated with HRP-conjugated goat anti-rat Ab (Amersham Pharmacia Biotech, Uppsala, Sweden) at 1/200 in RPMI containing 0.1% saponin, for 2 h at 4°C. The Cyanin-3 thymic shared Ag amplification kit (NEN Life Sciences) was used according to the manufacturer’s instructions. For LMP1 detection, cells were incubated with the CS1-4 Ab (DAKO) at 1/100 in RPMI containing 0.1% saponin and 5% normal goat serum for 1 h at 4°C, washed three times in PBS, and incubated with PE-labeled goat anti-mouse Ab (BioSource International, Camarillo, CA) at 1/500 for 1 h. After labeling, all cells were washed three times and incubated for 1 min with 4′,6′-diamidino-2-phenylindole (DAPI; Sigma-Aldrich). After three washes, the cells were mounted using Aqua Polymount (Polysciences, Warrington, PA). The slides were analyzed using an Olympus (Melville, NY) deconvolution microscope. Pictures were taken with an Olympus digital camera, and pictures were processed with Metamorph software (Universal Imaging, Downingtown, PA). Samples were boiled for 30 min in Laemmli sample buffer (Bio-Rad, Hercules, CA). Proteins were separated on 7.5% SDS-PAGE gels and, after blotting, stained with the EBNA1-specific rat Ab 1H4 or the EBV virus capsid Ag (VCA) high positive control serum, lot 090K6465C (Sigma-Aldrich). HRP-coupled α rat IgG (Amersham Pharmacia Biotech) or HRP-coupled α human IgG (Sigma-Aldrich) were used, respectively, as secondary Abs. Western blots were developed using the ECLplus kit (Amersham Pharmacia Biotech). ELISPOT assays were performed as previously described (42). MAHA S45 plates (Millipore, Bedford, MA) were coated with αIFN-γ Ab 1-D1K (Mabtech, Nacka, Sweden). Plates were blocked with DMEM + 5% human serum. Afterward, indicated amounts of responder T cells (for clonal T cell populations 104 T cells were used, because with 105 responder cells individual spots could no longer be distinguished) and 3 × 103 stimulator DCs or 104 LCL were added per well and incubated for 1 day. Then the plates were incubated with biotinylated αIFN-γ Ab 7-B6-1 (Mabtech). Afterward, preassembled avidin-peroxidase complexes in the form of Vectastain ABC kit (Vector Laboratories, Burlingame, CA) were added. Spots were developed by addition of stable diaminobenzidine (Research Genetics, Huntsville, AL). Plates were washed three times with water and air dried. Spot-forming cells were counted using a stereomicroscope (mean counts of triplicates). Where indicated, αHLA-DR Ab L243 (43), αHLA-A, B, C Ab w6/32 (44), or αHLA-DQ Ab IVD12 (45) were added at the indicated concentrations. Where indicated, peptides were pulsed onto target cells for 1 h at 37°C and washed before transfer into ELISPOT plate. EBNA1-derived peptides were synthesized by the F-moc solid-phase method on a peptide synthesizer (model 432A; Applied Biosystems, Foster City, CA). The peptides were analyzed by reverse-phase HPLC (System Gold; Beckman, Palo Alto, CA) and mass spectrometry (LD-TOF G2025A; Hewlett-Packard, Palo Alto, CA). The overlapping EBNA1401–641 peptide mixture contained peptides spanning the following sequences: 401–420, 411–430, 421–440, 431–450, 441–460, 451–470, 461–480, 471–490, 475–489, 482–496, 481–500, 491–510, 501–520, 506–520, 514–527, 521–540, 529–543, 531–550, 541–560, 551–570, 561–580, 571–590, 579–593, 581–600, 591–610, 601–620, 611–630, and 621–641. Targets were labeled with 50 μCi Na251CrO4 for 45 min at 37°C. Labeled targets were incubated for 18 h with CTL in RPMI + 10% FCS + 2 mM glutamine. An aliquot of the supernatant was harvested at 4–6 and 18 h and counted in Wallac OptiPhase SuperMix scintillation fluid in a Wallac 1450 MicroBeta TriLux plate counter (Wallac, Turku, Finland). Percent specific lysis was calculated by ((cpm experimental well − cpm spontaneous release)/(cpm maximum release − cpm spontaneous release)) × 100%. Spontaneous release was determined by incubating the labeled targets with medium, and maximum release by incubating targets in 1% Triton X-100 solution. At 18 h, spontaneous release varied between 20 and 30%. Where indicated, T cells were pretreated for 2 h at 37°C with either 100 nM concanamycin A (Fluka, Milwaukee, WI) or 10 μM brefeldin A (Sigma-Aldrich) and assayed in the presence of the drugs. For Ab blocking, T cells or target cells were preincubated for 1 h at 37°C with 10 μg/ml α-FasL, the Ab control α-perforin Ab (BD PharMingen), indicated concentrations of the HLA class I-specific Ab w6/32 (44), or the HLA-DR-specific Ab L243 (44), and assayed in the presence of these Abs. A total of 500 μl heparinized whole blood was placed in 4-ml polypropylene tubes (Fischer Scientific, Pittsburgh, PA) with 1 μg/ml each of anti-CD28 and anti-CD49d (BD PharMingen) and either RPMI (negative control), 10 μg/ml PHA (positive control), 20 μg/ml rPCNA control protein, or rEBNA1 protein. Cells were incubated for 12 h at 37°C in 5% CO2 at a 5° angle. A total of 10 μg/ml brefeldin A (Sigma-Aldrich) was then added, and samples were incubated for an additional 6 h. EDTA (20 mM) was added for 15 min, followed by 9 vol FACS lysing solution (BD PharMingen) for 10 min. Samples were then frozen at −80°C. Samples were subsequently thawed and permeabilized with 0.1% saponin and 0.1% BSA for 10 min. Cells were spun down and supernatant was decanted. The αIFN-γ-PE, αCD4-APC, and αCD69-FITC or αCD45RO-FITC Abs (BD PharMingen) were added for 30 min at room temperature. Samples were then washed with the permeabilization solution and fixed with 1% paraformaldehyde. FACS acquisition was performed on a four-color FACSCalibur (BD PharMingen). Gates were set on CD4+ cells and to include the nonautofluorescent cells in FL-3 (dump channel). Gates were combined, and 40,000 events were collected for each condition. Positively selected CD4+ T cells from an HLA-DR1-positive donor were stimulated with DC pulsed with the HLA-DR1-restricted EBNA1514–527 peptide (46). 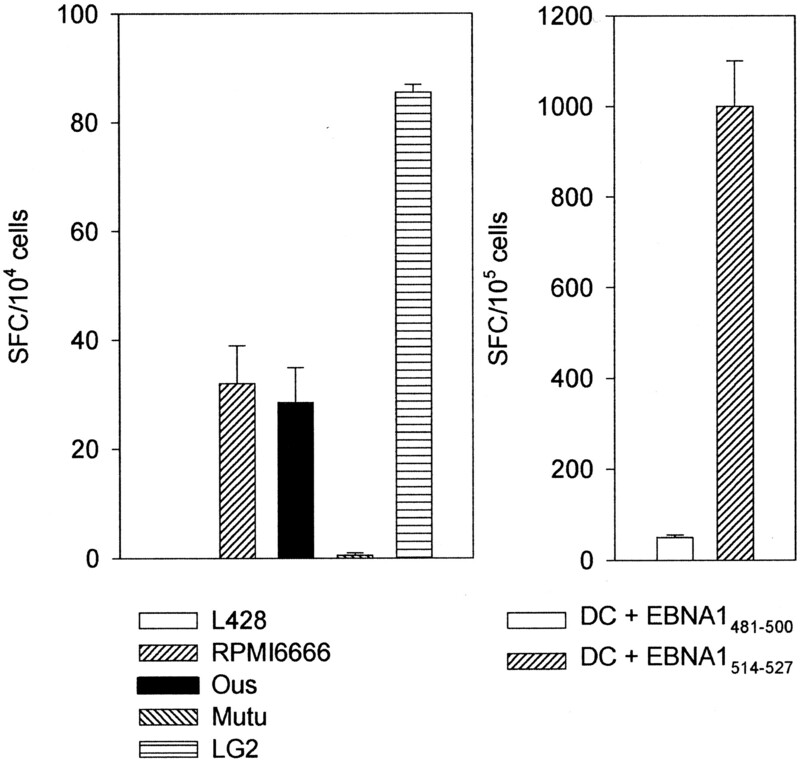 After two stimulations, this CD4+ T cell line showed specificity for EBNA1514–527 by IFN-γ secretion (Fig. 1⇓, right panel). In parallel, it secreted IFN-γ in response to the HLA-DR1-matched EBV-associated tumor cell lines without exogenous addition of EBNA1 Ag. These included the BL cell line Ous, the Hodgkin’s lymphoma cell line RPMI6666, and the lymphoblastoid cell line LG2 (Fig. 1⇓, left panel). Control HLA-DR1− targets such as the BL line Mutu and the EBV-negative Hodgkin’s lymphoma cell line L428 were not recognized. These data suggested that EBNA1-specific CD4+ T cells are able to mediate recognition of EBV latency I, II, and III malignancies, including BL. EBNA1-specific CD4+ T cell lines recognize EBV-associated malignancies of latency I, II, and III. CD4+ T cells from an HLA-DR1+ donor were stimulated with EBNA1514–527 peptide-loaded DCs for 2 wk. The line specifically recognizes EBNA1514–527 peptide-pulsed DCs and not control EBNA1481–500 peptide-pulsed DCs in IFN-γ ELISPOT assay (right panel). In addition, it secretes IFN-γ in response to the HLA-DR1+ cell lines, the BL cell line Ous, the Hodgkin’s lymphoma cell line RPMI6666, and the lymphoblastoid cell line LG2 (left panel). The HLA-DR1− BL cell line Mutu and the EBV− Hodgkin’s lymphoma cell line L428 are not recognized. One of three experiments is shown. Because BL cells may switch in vitro from expressing the EBV latency I to the EBV latency III program (47), we analyzed the EBV latent Ag expression in our cell lines. The BL cell lines Mutu and Ous used in this study grow in single cell suspension, typical for latency I, but not in clusters, which would indicate latency III (data not shown). To confirm that the BL cells we studied were indeed expressing the EBV latency I program, we analyzed the expression of EBNA1, EBNA2, EBNA3s, and LMP1. EBNA1 expression alone indicates the latency I phenotype, whereas LMP1 is expressed in the other latency programs II and III. EBNA2 and EBNA3s are only expressed in the EBV latency III program. Apart from the EBV-positive BL cell lines Mutu and Ous, we used the EBV-negative cell lines BL Ramos and Hodgkin’s disease (HD) L428 as negative controls, and BC LCL and LG2, EBV latency III lymphoblastoid cell line, as positive control. EBNA1 was detected by staining with the EBNA1-specific 1H4 Ab in deconvolution microscopy (Fig. 2⇓A, top row). Deconvolution microscopy visualized distinct EBNA1 staining in the nucleus, identified by costaining with DAPI, for Mutu, Ous, and BC LCL (Fig. 2⇓A, top row), but not the EBV-negative BL cell line Ramos (Fig. 2⇓A, top row). For confirmation, Western blots with EBV VCA high positive control serum visualized EBNA1 in EBNA1 transfectants of the HD line L428, the BL Mutu and Ous, as well as the LCL LG2, but EBNA2 and EBNA3s only in the LCL LG2 (Fig. 2⇓C). The EBV VCA high positive control serum and the EBNA1-specific Ab 1H4 stained a lower and a higher m.w. band of EBNA1. This pattern is characteristic for EBNA1 (48, 49). LMP1 expression was analyzed using the CS1-4 Ab. Intracellular FACS staining (Fig. 2⇓B) and deconvolution microscopy (Fig. 2⇓A, third row) were performed. Mutu, Ous, and Ramos were negative for LMP1 by intracellular FACS staining, while LG2 showed expression (Fig. 2⇓B). For confirmation, deconvolution microscopy showed patched staining of LMP1 in BC LCL, but not Ramos, Ous, and Mutu (Fig. 2⇓A, row 3). These data confirm the latency I BL phenotype in the Mutu and Ous lines. BL cell lines retain the EBV latency I expression phenotype. A, Fluorescence microscopy was performed to distinguish the EBV latency I (EBNA1 only) or latency II/III (EBNA1 and LMP1 expressed). The EBV− BL cell line Ramos (first column), the EBV+ BL cell line Mutu (second column), the EBV+ BL cell line Ous (third column), and the EBV latency III expressing BC LCL (fourth column) were stained with EBNA1 and LMP1 Abs. 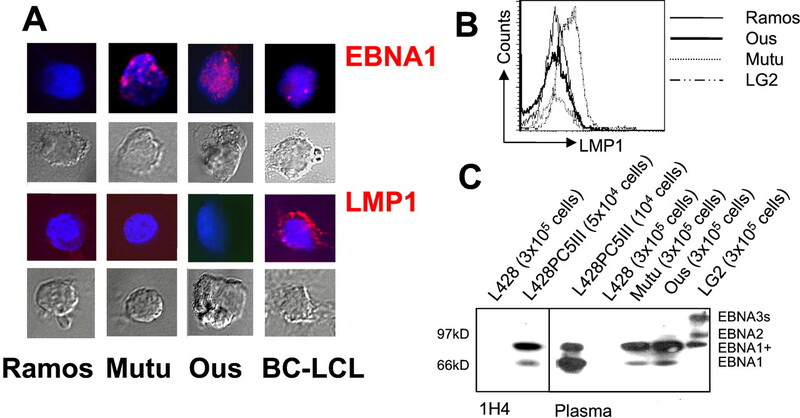 Costaining with DAPI showed localization of EBNA1 in the nucleus of Mutu, Ous, and BC LCL, while LMP1 staining was localized to the cell membrane only in BC LCL. Second and fourth rows show phase-contrast pictures of the stained cells as an indication of their viability. B, Intracellular FACS staining for LMP1. Only the lymphoblastoid cell line LG2 (broken dotted line) stained positive for intracellular LMP1. Ramos (thin line), Ous (thick line), and Mutu (dotted line) did not express LMP1. C, Western blot for EBNA Ags. EBNA1 could be detected with EBV VCA high control serum in an EBNA1 transfectant of the EBV− HD line L428 (L428PC5III), Ous, Mutu, and LG2, but not in the L428 mother cell line (right panels). The EBNA1-staining pattern of a higher (EBNA1+) and lower (EBNA1) m.w. band and the migratory behavior under our electrophoresis conditions were confirmed by staining in parallel with the EBNA1-specific Ab 1H4. EBNA2 and EBNA3s could only be detected in the LCL LG2 with EBV VCA high control serum. Due to the differences in the EBNA1 expression level of the used cell lines, less lysate was loaded for the EBNA1 transfectant. The presented data were repeated twice. To ensure that EBNA1 recognition and reactivity against EBV-associated malignancies were mediated by the same CD4+ T cells, EBNA1-specific CD4+ T cells were cloned. Cloning was performed either directly from the EBNA1-specific A4 and RJD lines or, after two rounds of stimulation and enrichment with EBNA1-presenting DC, from the EBNA1-specific BC line by limiting dilution of 10, 1, and 0.3 cells/well. A total of 25 clones was obtained from 0.3 and 1 cell/well plates for the three different donors. The clonality of 7 representative 0.3 and 1 cell/well cultures was addressed by FACS staining for single TCR Vβ usage. The clones were homogeneously positive for CD4 and CD3, negative for CD8, and for 5 of 7 representative clones, a single TCR could be identified as assessed with two panels of either 16 or 22 Abs directed against the V regions of the β-chain. BC.E110 and A4.E116 reacted with none of the used Abs; BC.E112 stained homogenously for Vβ2, BC.E120 for Vβ20, BC.E122 for Vβ8, BC.E160 for Vβ13.1, and RJD.E113 with Vβ22 (data not shown). The specificity of the BC clones was tested in IFN-γ ELISPOT assay against DC infected with control vv (vvTK−), EBNA1-encoding vv (vvEBNA1ΔGA), a HLA-DR-mismatched LCL (LG2), and the autologous LCL (BC LCL). The clones secreted IFN-γ upon recognition of EBNA1-expressing DCs and the autologous LCL, but not control vvTK−-infected DCs or HLA-DR-mismatched LCL (Fig. 3⇓). Endogenous EBNA1 expression by vv infection sensitizes DCs for recognition by EBNA1-specific CD4+ T cell clones. The five EBNA1-specific CD4+ T cell clones, BC.E110, BC.E112, BC.E122, BC.E160, and BC.E120, recognized vvEBNA1ΔGA-infected DCs and the autologous BC LCL by secretion of IFN-γ in ELISPOT assays. The control targets vvTK−-infected DCs and the HLA class II-mismatched LCL LG2 were not recognized. One of four experiments is shown. 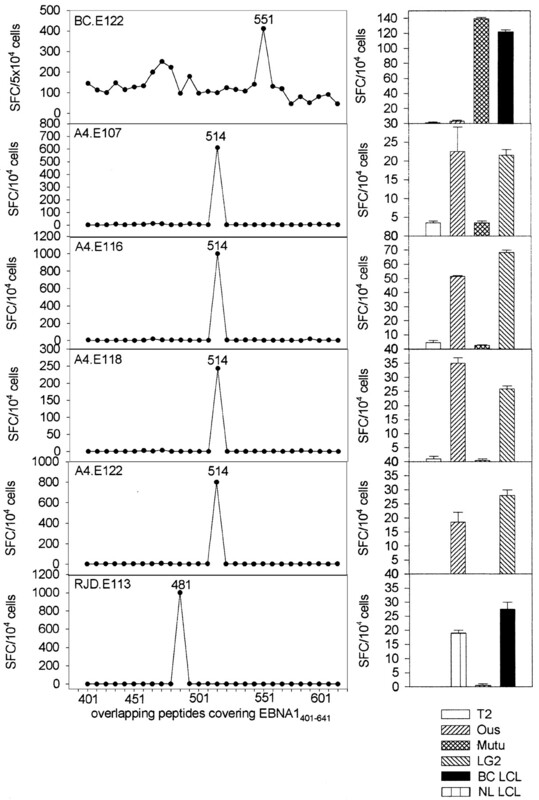 The EBNA1 specificity of the A4 and RJD clones was analyzed with DCs pulsed with overlapping peptides derived from the EBNA1401–641 sequence (Fig. 4⇓). The A4 clones expanded for this analysis, A4.E107, A4.E116, A4.E118, and A4.E122, recognized the EBNA1514–527 peptide. In addition, these clones secreted IFN-γ in response to the BL line Ous and the LCL LG2, but not the CEM/LCL hybrid T2 and the BL line Mutu. This recognition pattern is consistent with HLA-DR1 restriction, as previously described for this peptide (46). The RJD.E113 clone recognized the EBNA1481–501 peptide specifically (Fig. 4⇓), which was also targeted by its mother cell line (data not shown). In addition, it secreted IFN-γ in response to the BC LCL and NL LCL, and not the CEM/LCL hybrid T2 and the LCL LG2. This recognition pattern is consistent with HLA-DQ2 or HLA-DQ3 restriction. In addition, the EBNA1 specificity of the BC.E122 clone was confirmed by mapping its epitope to the EBNA1551–570 sequence. It also secreted IFN-γ in response to the autologous BC LCL and the BL line Mutu. These data confirmed that clonal populations of EBNA1-specific CD4+ T cells are able to recognize lymphoblastoid cell lines and, in the case of the BC and the A4 clones, BL cells. EBNA1 epitope and lymphoma recognition by CD4+ T cell clones. Overlapping peptides spanning the EBNA1401–641 sequence were used to identify T cell epitopes recognized by CD4+ T cell clones from three different donors. 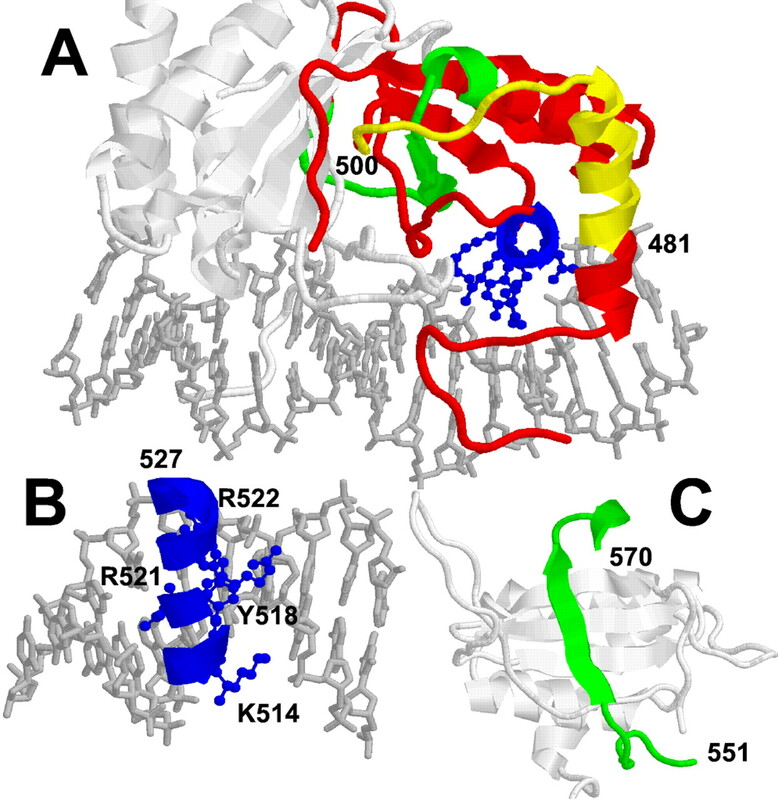 Three peptides could be identified as T cell epitopes: EBNA1551–570 (BC.E122; top panel), EBNA1514–527 (A4.E107, A4.E116, A4.E118, A4.E122; second to fifth row), and EBNA1481–500 (RJD.E113; bottom panel). In addition, the BL lines Ous and Mutu and the LCL LG2, BC LCL, and NL LCL were tested for recognition by the CD4+ T cell clones (right panels). The HLA class II-negative CEM/LCL hybrid T2 served as a negative control in these assays. One of two experiments is shown. The HLA restriction of the EBNA1-specific CD4+ T cell clones was further analyzed with a panel of lymphoma cell lines and MHC-blocking experiments. The majority of the BC clones, BC.E110, BC.E112, and BC.E122, were HLA-DR7 restricted, but BC.E160 was HLA-DR4 restricted. The BC.E120 clone did not expand well and could not be analyzed in more detail. The HLA-DR7-restricted clones (exemplified by clone BC.E122 in Fig. 5⇓) recognized the HLA-DR7-positive targets Ag876, Mutu, and BC LCL, while the HLA-DR4-restricted clone BC.E160 recognized HLA-DR4-positive targets, Ous and BC LCL (Fig. 5⇓). Therefore, two HLA-DR restriction elements of this donor were able to be recognized on EBV latency I (Mutu or Ous) and III (Ag876 and BC LCL) targets by IFN-γ secretion. The LCL LG2 and the LCL/CEM hybrid T2 (HLA-DR4−, HLA-DR7−) served as negative controls. Interestingly, not only the EBV latency I and III lymphomas were recognized similarly by the BC clones, but in the case of HLA-DR7 restriction EBV type 1 and 2 transformed B cells were targeted similarly. The EBV type 2 transformed cell line Ag876 was well recognized by BC.E122 (Fig. 4⇑). In addition, we analyzed the effect of MHC blocking on the recognition of lymphoma cells by EBNA1-specific CD4+ T cells. IFN-γ secretion was indeed mediated by HLA-DR restriction. The HLA-DR-specific Ab L243 could block recognition by all BC clones in a dose-dependent manner (as examples, blocking of Mutu and BC LCL recognition is shown for BC.E122 and BC.E160 in Fig. 5⇓). The HLA class I-specific Ab w6/32, used as a control, showed no effect. The A4.E116 clone in contrast recognized the HLA-DR1-positive targets BL Ous, HD RPMI6666, and LCL LG2, while T2, BL Mutu, and EBV− HD L428 were not recognized. Consistent with HLA-DR1 restriction, recognition of the LCL LG2 could be blocked with the HLA-DR-specific Ab L243, but not with the HLA class I-specific Ab w6/32 or the HLA-DQ-specific Ab IVD12 (Fig. 5⇓). In contrast, the RJD.E113 clone recognized the EBV− HD cell line L428 after transfection with EBNA1, but only the transfectant showing the higher EBNA1 expression level (L428PC5III). This recognition could be blocked with the HLA-DQ-specific Ab IVD12, but not with the HLA-DR-specific Ab L243 or the HLA class I-specific Ab w6/32 (Fig. 5⇓). In addition, NL LCL and BC LCL, but not LG2, provoked IFN-γ secretion by this clone. This recognition pattern is consistent with HLA-DQ2 or HLA-DQ3 restriction. In conclusion, HLA-DR- as well as HLA-DQ-mediated recognition of EBNA1 expressed in latency I, II, and III lymphoma cells triggers IFN-γ secretion by these CD4+ T cells. EBNA1-specific CD4+ T cell clones are HLA-DR or HLA-DQ restricted. Left panels, HLA-typed cell lines were tested for recognition by the EBNA1-specific CD4+ T cell clones BC.E122, BC.E160, A4.E116, and RJD.E113. These included the BL lines Mutu and Ous, the latency III BL line Ag876, the HD line RPMI6666, the CEM/LCL hybrid T2, the EBV− HD line L428, its EBNA1low transfectant L428PIIFA and EBNA1high transfectant L428PC5III, and the LCLs LG2, LRM, BC LCL, and NL LCL. Right panels, Blocking of IFN-γ secretion by EBNA1-specific CD4+ T cell clones using different αHLA Abs, w6/32 (αHLA class I), L243 (αHLA-DR), and IVD12 (αHLA-DQ). One of three experiments is shown. In addition to secretion of Th1 cytokines in response to EBNA1 expressed endogenously by lymphoma cells, we also analyzed the capacity of EBNA1-specific CD4+ T cells to directly affect the tumor cells. We tested our EBNA1-specific CD4+ T cell clones in 51Cr release assays. 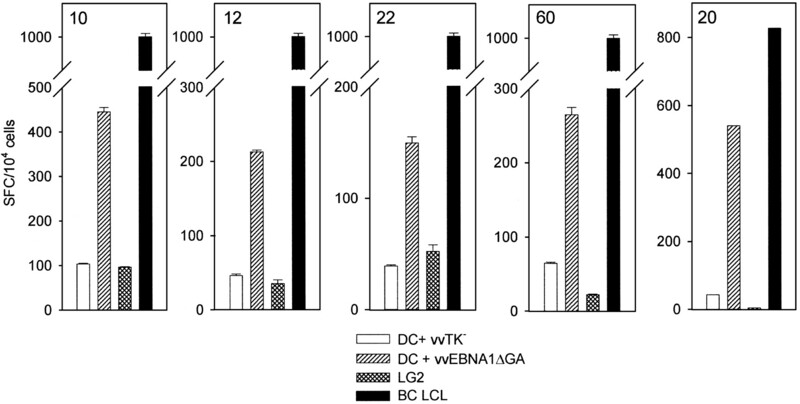 The clones were capable of lysing LCL as well as HLA-DR-matched BL cell lines (Fig. 6⇓). The HLA-DR7-restricted clones (exemplified by BC.E122 in Fig. 6⇓) killed Mutu BL cells and autologous LCL, BC LCL. The HLA-DR4-restricted BC.E160 clone killed Ous BL cells and also the autologous LCL, BC LCL (Fig. 6⇓). The HLA-DR1-restricted clones (exemplified by A4.E116 in Fig. 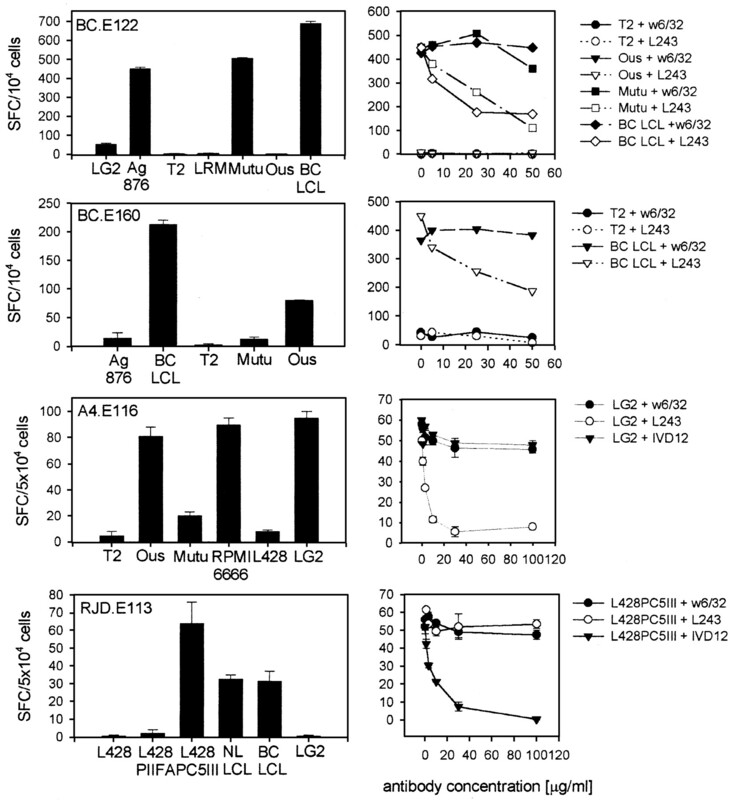 6⇓) killed Ous BL cells and the LCL LG2. The HLA-DR-mismatched BL cells and the HLA-DR− T2 cells were not recognized and remained intact during the cytotoxicity assay. These data indicate that EBNA1-specific CD4+ T cells, in addition to supporting Th1-based EBV immunity, can also directly lyse EBV-transformed B cells. EBNA1-specific CD4+ T cell clones kill lymphoma cells of EBV latency I and III. The HLA-DR7-restricted clone BC.E122 showed cytolytic activity in 18-h 51Cr release assay against HLA-DR7+ targets, BL Mutu and BC LCL, but not against the HLA-DR7− targets, BL Ous and T2 (left panel). The HLA-DR4-restricted clone BC.E160 kills HLA-DR4+ targets, BL Ous and BC LCL, but not the HLA-DR4− targets, Mutu and T2 (middle panel). The HLA-DR1-restricted clone A4.E116 kills HLA-DR1+ targets, BL Ous and LCL LG2, but not the HLA-DR1− targets, Mutu and T2 (right panel). One of five experiments is shown. Next, we analyzed the cytotoxicity mechanism of our clones in three ways (representatively shown for clone BC.E122 in Fig. 7⇓) kinetics of cytotoxicity, drug-mediated inhibition, and Ab blocking. All clones showed weak killing after 5-h incubation with the lymphoma targets, but cytotoxic effects were clearly visible after 18 h (Fig. 7⇓A). This slower killing suggests apoptosis induced by TNF family molecules on the CD4+ clones, such as FasL, TNF-α, or TNF-related apoptosis-inducing ligand (50). Concanamycin A is an inhibitor of the vacuolar type H+-ATPase and disables perforin-mediated lysis. This reagent had relatively little effect on the killing of the HLA-DR-matched lymphoma cells by our EBNA1-specific CD4+ T cell clone BC.E122 (Fig. 7⇓B). In contrast, brefeldin A, which inhibits TNF-based killing, abrogated lysis by this clone (Fig. 7⇓B). These distinct effects of concanamycin A and brefeldin A suggested that EBNA1-specific CD4+ T cells mainly kill by inducing apoptosis (51, 52, 53). To extend this result, we showed that BC.E122-mediated lysis could be mainly blocked with a FasL-specific Ab, but only minimal by an Ab control, anti-perforin (Fig. 7⇓C). Confirming HLA class II restriction of our EBNA1-specific CD4+ T cell clones, cytolysis of HLA-DR7+ EBV+ targets Mutu and BC LCL could be blocked by addition of the HLA-DR-specific Ab, but not the MHC class I-specific Ab w6/32 (Fig. 7⇓D). EBV+ HLA-DR7− Ous and EBV+ HLA-DR7− LG2 cells served as negative controls. We conclude that one cytolytic effector mechanism of our HLA-DR-restricted EBNA1-specific CD4+ T cell clones is Fas/FasL-mediated lysis. HLA-DR-restricted EBNA1-specific CD4+ T cell clones can kill via Fas/FasL-mediated cytotoxicity. 51Cr release assays performed with the BC.E122 clone are shown as an example. Killing of the HLA-DR7+ targets Mutu and BC LCL is hardly visible after 5-h incubation, but becomes apparent after 18-h incubation (A). The control targets Ous and T2 are not lysed above background at either time point. 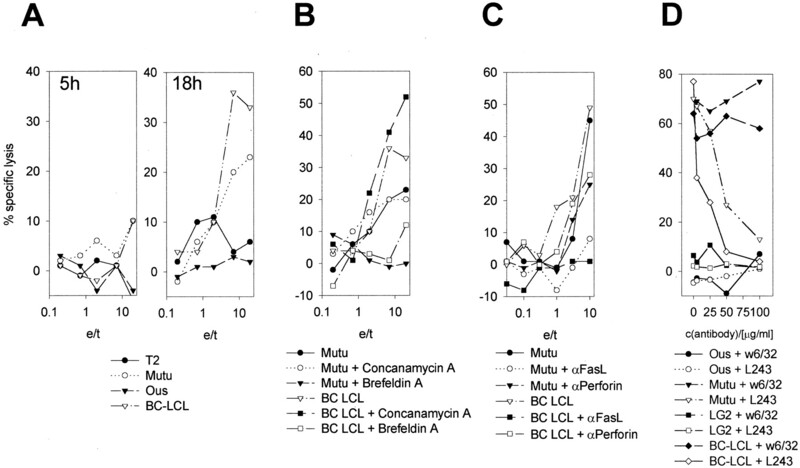 Killing of Mutu and BC LCL can be inhibited by brefeldin A, but not concanamycin A during 18-h incubation (B). FasL blocking, but not incubation with a control Ab, α-perforin, abrogates lysis (C). The HLA-DR-specific Ab L243, but not the HLA class I-specific Ab w6/32, blocks lysis of the EBV+ HLA-DR7+ targets Mutu and BC LCL (D). LG2 and Ous cells served as negative controls. One of three experiments is shown. We were intrigued by the fact that all the three EBNA1 epitopes recognized by our clones were located within the 200 C-terminal amino acids of EBNA1. Indeed, we had observed previously that EBNA1-specific CD4+ T cell lines recognized DCs loaded with rEBNA1458–641 with similar efficiency as vvEBNA1ΔGA-infected or rEBNA1ΔGA (bEBNA1)-loaded DCs (32, 33), and similar frequencies of EBNA1-specific CD4+ T cells were determined with autologous DCs either infected with vvEBNA1ΔGA or loaded with rEBNA1458–641 (data not shown). 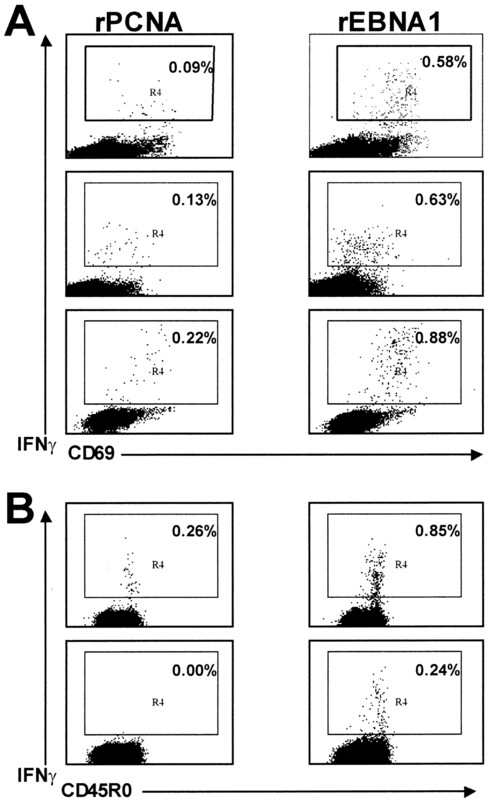 To consolidate this finding in more healthy EBV carriers as well as to determine the frequency of EBNA1-specific CD4+ T cells, we analyzed IFN-γ secretion by intracellular cytokine staining ex vivo (Fig. 8⇓). Whole peripheral blood of five healthy, seropositive individuals was stimulated by the addition of rEBNA1458–641 or the control protein rPCNA. IFN-γ, but no IL-4 secretion (data not shown) was detected in all donors after stimulation with rEBNA1458–641 (Fig. 8⇓). EBNA1-specific CD4+ T cells constituted 0.496% (average of rEBNA1-specific IFN-γ responses after substraction of background rPCNA IFN-γ responses) of the peripheral CD4+ T cell pool in the five donors tested (Fig. 8⇓). Within the five donors tested, the percentage of EBNA1-specific CD4+ T cells ranged from 0.24 to 0.66%. EBNA1-specific CD4+ T cells are preferentially memory cells, as identified by CD45RO expression (Fig. 8⇓B). Therefore, we conclude that CD4+ T cell responses in healthy EBV carriers are indeed directed against the C-terminal, episome-binding domain of EBNA1 and appear with a frequency of ∼0.5% in the peripheral blood. EBNA1-specific CD4+ T cells recognize the C-terminal domain of EBNA1 and form a substantial proportion of peripheral blood CD4+ T cells in healthy EBV carriers. Whole blood was collected from asymptomatic EBV carriers and incubated for 18 h in the presence of recombinant control protein, rPCNA, or rEBNA1458–641 protein. Cells were fixed, permeabilized, and stained for IFN-γ and the T cell activation marker, CD69 (A), or CD45RO (B). Results shown are gated on CD4+ T cells. Five different healthy EBV-seropositive individuals were analyzed. The susceptibility of BL to CD4+ T cell-mediated cytolysis contrasts with this tumor’s ability to escape MHC class I-restricted immune surveillance. Burkitt’s cells escape immune control by CD8+ T cells in at least four ways. First, the tumor cells down-regulate the expression of all except one EBV latent Ag, EBNA1. Second, EBNA1 itself blocks its processing onto MHC class I in cis (20), and is therefore invisible to CD8+ T cells within lymphoma cells. Third, BL cells down-regulate MHC class I adhesion molecules and TAP expression, resulting in a potentially broad reduction of Ag presentation to CD8+ T cells even after transfection of CD8+ T cell Ags into the tumor cells (25, 54). MHC class I down-regulation by BL cells affects HLA alleles differently (55). Only TAP-independent Ags or peptides modified with ER signal sequences can overcome this MHC class I processing deficiency (56, 57, 58). Down-regulation of MHC class I and/or TAP is a more commonly observed immune evasion strategy for tumor cells, and it can be overcome by transfection with T cell epitopes linked to ER signal peptides also in melanoma cells (59). Fourth, BL cells express Fas only after CD40 triggering (60), thereby probably avoiding FasL-mediated lysis by CD8+ T cells. This disables one of the two main CTL effector functions of T cell-mediated cytotoxicity. In contrast, MHC class II processing and presentation seem to be normal in BL. This has been shown for the first time for a physiologically expressed Ag, EBNA1, in this study and previously for EBNA2 transfected into BL cells (61). Moreover, CD4+ T cells are able to induce Fas expression on BL via CD40/CD40 ligand ligation and can use Fas/FasL-mediated killing against BL cells (Fig. 7⇑). This suggests that CD4+ T cell recognition of BL cells in healthy EBV carriers is protective against the outgrowth of this tumor in the absence of CD8+ T cell immune control of EBV latency I malignancies. Finally, CD4+ T cells might in general be effective against other tumors that show down-regulation of TAP and MHC class I as immune escape strategies such as melanoma. The increased incidence of BL in the setting of AIDS, which globally compromises CD4+ T cells, also speaks in favor of an important contribution to CD4-based immune control of BL in healthy EBV carriers (6, 7, 8). The association of BL with holoendemic malaria infection (3) in vivo could interface with Th1-based CD4+ T cell control against this disease. In malaria, clearance of the erythrocytic stage of Plasmodium falciparum is achieved by a humoral, Th2-based immune response (62, 63). We suggest that during establishment of EBV-specific T cell immunity, the preexisting Th2 cytokine milieu that resists malaria, polarizes or diverts the EBV-specific immune response to a Th2-based response (64, 65). In contrast, a Th1-based immune response against EBNA1 develops in most healthy EBV carriers (33). This type of CD4+ T cell response is most likely valuable for immune control in other viral infections (66, 67). We propose that a Th2-based EBNA1 response will be more common in regions with holoendemic malaria, and that this would compromise resistance to EBV latency I tumors like BL. Along these lines, P. falciparum in its erythrocytic state disables DCs (68), dampening the capacity of these cells to polarize CD4 T cells to Th1 (69, 70). DCs can indeed cross-present EBV latent Ags (32, 71) and have been implicated in the priming of EBV immunity (72). In contrast, Ag presentation by B cells has been shown to be required for protection against systemic malaria infection, probably inducing a Th2-like immune response (73). A lack of EBV Ag presentation by IL-12-secreting DCs, combined with direct presentation by infected B cells, might lead to a Th2 and less protective immune response against EBV latency favoring the development of BL. The discovery that CD4+ Th1 cells can respond to BL cells, by releasing IFN-γ and exerting FasL-dependent cytotoxicity, suggests that the quality and quantity of the adaptive EBNA1 response be subject to additional study in endemic areas and in patients with this malignancy. Immunity against BL based on CD4+ T cells might also be long lasting because CD4+ T cell maintenance seems to be independent of help by other lymphocytes. In contrast, CD8+ T cell memory in the absence of CD4+ T cells has been shown to be short-lived and nonprotective against chronic viral infections like lymphocytic choriomeningitis virus and MHV-68 (74, 75). CD8+ T cells alone are able to clear acute infection (75), probably due to the inflammatory environment that activates APCs like DCs for CD8+ T cell priming. In the absence of inflammation, however, CD4+ T cells are needed for memory CD8+ T cell maintenance (74). On the contrary, CD4+ T cells have been shown to be sufficient for the control of chronic MHV-68 infection in vivo (76, 77). Moreover, outgrowth of EBV-transformed B cells in culture can be suppressed by CD4+ T cells of healthy EBV carriers (78), and EBNA1 is the most consistently recognized CD4+ T cell Ag in EBV latency (32). With ∼0.5% of peripheral memory CD4+ T cells against this individual latent EBV Ag, the T cell resources committed to target this Ag are comparable with human CMV-specific CD4+ T cell responses that constitute ∼2% of peripheral memory T cells against all CMV Ags (79, 80). We therefore propose that EBNA1-specific CD4+ T cells are not only the sole specificity recognizing BL cells by means of EBV Ags, but also capable of maintaining immune control against EBV-associated malignancies. Interestingly, the EBNA1-derived CD4+ T cell epitopes are mainly located in the C-terminal, episome-binding domain of EBNA1, demonstrated by CD4+ T cell reactivity against rEBNA1458–641 in most donors and the three individual T cell epitopes indentified in our study. Accumulation of EBNA1 epitopes in the EBNA1401–641 sequence was also reported recently by A. Leen and colleagues (81). The HLA-DR1-restricted EBNA1514–527 epitope is derived from an α-helix contacting the major groove of the EBV episome (14) (Fig. 9⇓, A and B). Four residues of this peptide make contact with the DNA backbone, K514, Y518, R521, and R522 (14) (Fig. 9⇓B). Two of these, Y518 and R521, have been suggested to serve as anchor residues in the binding to HLA-DR1 (82). This implies that immune escape by mutation of this epitope would endanger the crucial function in episome maintenance fulfilled by EBNA1. Similarly, the HLA-DR7-restricted EBNA1551–570 epitope forms part of the β-sheet mediating dimerization of EBNA1 (Fig. 9⇓C). Conservation of this protein structure is in the interest of the virus, and immune escape from the CD4+ T cell response directed against this epitope would be difficult. Finally, the HLA-DQ-restricted EBNA1481–500 epitope forms part of an α-helix in the structure of the C-terminal domain of EBNA1 (Fig. 9⇓A). There is no direct contribution to dimerization or episome binding by this EBNA1 sequence. Overall, two of the three epitopes targeted by our CD4+ T cell clones are derived from elements of the episome-binding domain of EBNA1 that mediate crucial functions in viral persistence. EBNA1-derived CD4+ T cell epitopes contribute to the function of EBNA1. Using the RasMol version 2.6-β-2 software (www.openrasmol.org) and the Brookhaven Protein Data Bank (PDB) file of the crystal structure solved for the EBNA1461–607 dimer complexed to 18 bp of EBV episome (PDB file 1B3T, www.rcsb.org/pdb/index.html), the EBNA1 epitopes EBNA1481–500, EBNA1514–527, and EBNA1551–570 were highlighted in a cartoon (protein)/sticks (DNA) depiction. Residues referred to in Discussion are numbered, and residues described to interact with DNA by Bochkarev et al. (14 ) are shown in ball and stick mode. The localization of the EBNA1 epitopes with respect to the Gly/Ala domain suggests further that processing of the HLA class II epitopes is proteasome independent. Recent evidence demonstrated that most of the MHC class I ligands are derived from defective ribosomal products of proteins (83, 84), digested by the proteasome, and this pool of misfolded or early terminated polypeptides could also serve as a source of MHC class II ligands. Indeed, studies addressing the endogenous Ag processing for MHC class II have implicated the MHC class I Ag-processing machinery in the generation of MHC class II ligands (85, 86, 87, 88). One could speculate that early terminated defective ribosomal products of EBNA1 without the Gly/Ala repeat could get degraded by the proteasome and follow the endogenous MHC class I-processing pathway for loading onto MHC class II. However, because the MHC class II epitopes of EBNA1 are located C terminal of the Gly/Ala repeat, the protein source of EBNA1-derived MHC class II ligands has to contain this proteasome-blocking domain and cannot be degraded via the conventional endogenous Ag-processing pathway. This implies that endogenous EBNA1 processing for MHC class II presentation represents a novel Ag-processing pathway. The characteristics of this pathway are currently under investigation in our lab. In summary, EBNA1 is the only EBV Ag expressed in all EBV-associated malignancies and is invisible to CD8+ T cells due to a lack in MHC class I processing. The experiments presented in this work demonstrate that CD4+ T cells recognize endogenous expression of EBNA1 and kill EBNA1 expressing BL cells. We suggest that this valuable immune response should be targeted to enhance resistance against EBV-associated malignancies. We thank Ralph M. Steinman for critically reading the manuscript; David Posnett for the gift of αTCR Vβ Abs; Friedrich Grässer for the gift of the 1H4 Ab; and Martina Vockerodt, Dieter Kube, and Rajiv Khanna for the gift of cell lines. ↵1 C.M. was supported by the Lymphoma Research Foundation of America and the Leukemia & Lymphoma Foundation, J.-F.F. was supported by the Association Française pour la Recherche sur le Cancer, and K.B. by a National Institute of Allergy and Infectious Diseases grant (K08A149958-01). 3 Abbreviations used in this paper: BL, Burkitt’s lymphoma; DAPI, 4′,6′-diamidino-2-phenylindole; DC, dendritic cell; EBNA, Epstein-Barr nuclear Ag; ER, endoplasmic reticulum; FasL, Fas ligand; HD, Hodgkin’s disease; LCL, lymphoblastoid cell line; LMP, latent membrane protein; PCNA, proliferating cell nuclear Ag; rh, recombinant human; TK, thymidine kinase; VCA, virus capsid Ag; vv, vaccinia virus. Kieff, E., A. B. Rickinson. 2001. Epstein-Barr virus and its replication. D. M. Knipe, and P. M. Howley, eds. Fields Virology 2511 Lippincott-Raven, Philadelphia.